The ability to produce morphologically and developmentally normal embryos from undifferentiated somatic cells in culture through somatic (asexual) embryogenesis resides uniquely in the Plant Kingdom. Since the initial description of somatic embryo production from carrot callus cells (Steward et al., 1958), this unique developmental potential has been recognized as an important pathway for the regeneration of plants from culture systems, as well as a potential model for investigation of the morphology and regulation of plant embryogenesis. 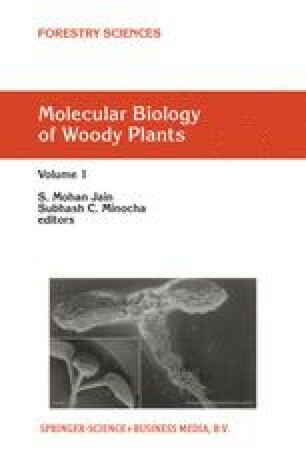 Somatic embryogenesis in higher plants has been reported in various angiosperm and gymnosperm plant species; this review will concern somatic embryogenesis in coniferous species (see reviews by Dunstan et al.,1995; Gupta and Grob, 1995; Tautorus et al., 1991). Conifer somatic embryo development undergoes similar morphological changes to those in zygotic embryo development, although somatic embryogenesis relies upon changes in culture conditions during induction of embryogenic tissues, stimulation of embryo maturation, desiccation and subsequent germination. Somatic embryogenesis in conifers is being used for the large-scale multiplication of a small number of diverse species (Gupta et al., 1993; Dunstan et al., 1995). Somatic embryos are also used as the target materials for plant transformation, e.g., via particle microprojectile (Bommineni et al., 1993; Charest et al., 1996; Ellis et al., 1993). There are several recent reviews of the development, nutritional requirements and cultural aspects of conifer somatic embryogenesis (Tautorus et al.,1991; Dunstan et al., 1995, Feirer, 1995; Gupta and Grob, 1995; von Arnord et al., 1996). The main challenges to overcome include the low frequency and synchrony of embryo maturation, and embryo conversion into plantlets. In order to develop protocols for controlled embryogenesis and production of superior quality somatic embryos, a basic understanding of the biochemical and molecular processes that underlie the formation of somatic and zygotic embryos is essential.